I stopped timing myself when I run. This started in early winter after I’d gone a long stretch without running at all. 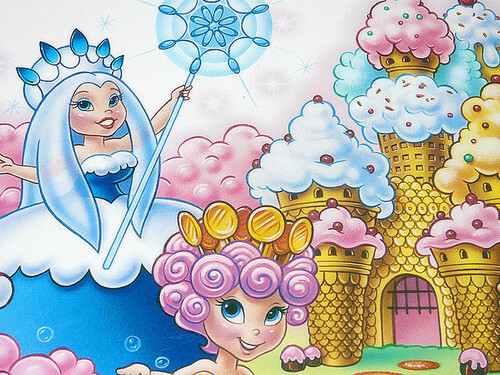 My fitness level felt like I’d slid backwards from Queen Frostine to the Peppermint Forest, and rather than get totally discouraged, I decided to lower the bar. It worked. I’m still running. No idea how quickly or not-quickly, but speed never was the point. I run because I feel good afterwards. I run because the simple act allows me to eat cookies. I run to connect with nature and other people. 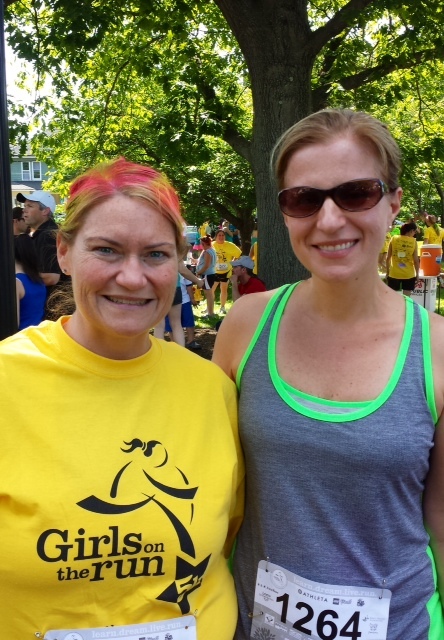 Last weekend was the 5K I signed up to run with Josie, a great sober blog and race buddy. Thanks, Josie, for the heads up on this race and for this photo of us before the start. Josie’s the one with the fancy-colored hair. You know, I’ve always said I wanted pink hair and completely blew the chance to get it. Wth? It was a beautiful day and the run was in a lovely, historic town. I love races through small towns because neighbors come out on their lawns to wave and cheer and occasionally spray garden hoses in the street for us to run through and cool off. My two daughters also joined us for this race. My oldest is 13 and she found her own pace and beat her previous finish time by an impressive amount. I’m really proud of her and beamed when she told me she wants to keep running and possibly sign up for track next spring. 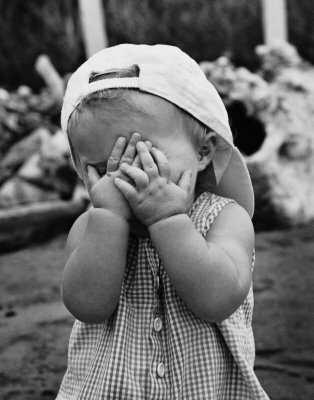 My youngest daughter is six years old. A 5K is 3.1 miles, which is a long distance for someone with little legs! She’s a determined little whipper snapper though. She told me two Decembers ago that she wanted to race with me. She even had her outfit picked out down to a purple jacket that she promptly outgrew. This particular race was very kid-friendly, so we signed her up and practiced walk-running 3.1 miles and got covered in tar for good measure. We were ready! Her strategy was a zig-zag pattern of too-quick sprints and walk-dragging, with an occasional skip through friendly-neighbor hose spray. She did wipe out coming off a curb near the water table, but she didn’t cry due to an emergency bandaid in my pocket and the kindness of a volunteer who saw the whole thing and brought her a cup of water and told her she was “very brave”. She popped back up and walk/ran/skipped to the finish line, and both daughters are still talking about the post-race bagels. I have no idea where this love of food comes from. 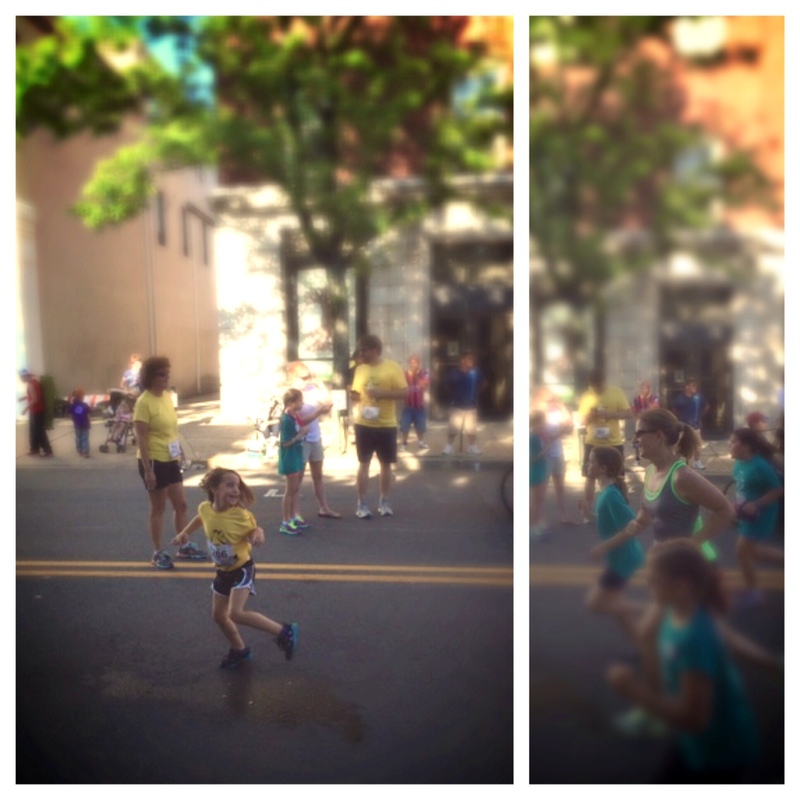 Here’s a couple of pictures, stitched together, that my husband took just before my youngest crossed the finish line. She’s in yellow, I’m in gray. Awww I love that the girls joined you~ I also love that you ditched the running watch and gadgets so you can just run and be in the moment! Sorry I couldn’t have joined you ladies~ next time! What an incredibly uplifting posting! I loved the picture at the end. Thanks for sharing. You go, girl! This is so great. I love that your daughters joined you. What a fantastic way to show them sobriety can mean so many things that are positive. The pictures show the joy and element of success. Awesome! Oh, my. Run, girls run. You have spunky daughters, which is a very good thing. I am most impressed by the 6 year-old, because, yah. Little legs. Thanks for your inspirational writing. I wanted to send you this link to a recovery blog I am writing; it is a set of daily meditations based on inspirational movie quotes. and if your other reader does put together a BBB sober 5K race – we’re in too!